I have previously written some posts on malaria, the challenges in treating and vaccination strategies. Research continues on these fields with significant progress being made. However, isn't it interesting that I never talked about cerebral malaria. I couldn't find a good recent statistics of malaria burden, but the reports indicate that there is a significant decrease in number of cases on a global scale. However, if you consider the parasitic infections, malaria stands taller than anybody else. Of the people infected with P falciparum, roughly 10% have cerebral malaria (CM) depending on the geography. Nearly 575,000 children in Africa develop cerebral malaria annually. On a global scale CM is a significant problem. The mechanism of CM is not a well understood phenomenon. Studies to understand the pathogenesis have been carried in murine models involving C57BL/6 or CBA mice infected with P berghei ANKA. 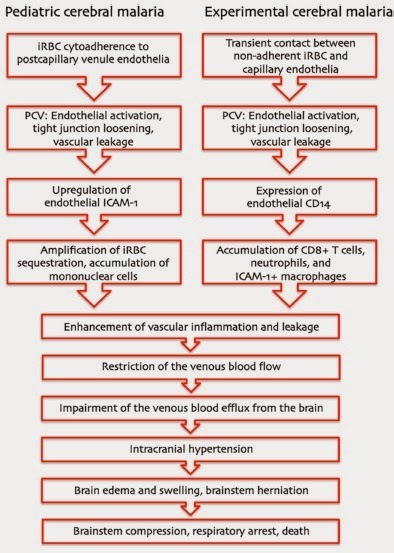 Currently, It is the best models to study CM pathogenesis. In models, it has been shown that cytoadherence of parasite and disruption of blood brain barrier, leads to hemorrhages and necrosis of the surrounding tissues and cerebral edema. The increased brain volume which leads to compression and raised intra cranial pressure is probably the reason for fatality. In a recent paper in NEJM, this has been studied using MRI scans and confirmed validating the previous understanding. As Dr Taylor puts it, "Because we know now that the brain swelling is what causes death, we can work to find new treatments. The next step is to identify what's causing the swelling and then develop treatments targeting those causes. It's also possible that using ventilators to keep the children breathing until the swelling subsides might save lives, but ventilators are few and far between in Africa at the moment". Perhaps the most focused part of studying the CM is cytoadherence. Cytoadherence is the phenomenon of sticking together of RBC to the vascular membrane. The best described adhesin studied in P falciparum is PfEMP1 (P. falciparum erythrocyte membrane protein 1). The protein is encoded by "var" gene and large transmembrane protein (200–350 kDa) comprising several external Duffy-binding-like domains. The structure of PfEMP1 includes a large extracellular N-terminal domain, a transmembrane region and a C-terminal intracellular domain. The extracellular domain is highly variable and at least a 50 variants are known. The C terminal anchors protein to the RBC membrane and is conserved structure. The protein is encoded by "var" gene and large transmembrane protein (200–350 kDa) comprising several external Duffy-binding-like. The PfEMP1, is produced by the parasite and inserted to the RBC membrane by protein trafficking. The inserted protein is called as a knob. The PfEMP1 has an important role of immune evasion. Studies have shown that the knob has a positive charge and hence better electrostatic interaction with negatively charged endothelial plasma membranes and receptors. Cytoadherence prevents malarial parasites from being recognized and cleared off the circulation by the spleen. In addition the variance adds to immune evasion. There are several receptor interactions in the picture, the most important include- CD36, TSP, CD54, ICAM-1, VCAM-1 and P- selectin. It has also been speculated that the rosetting (clumping), slows the movement and oxygenation of RBC which provides a anaerobic rich growth environment for parasite. 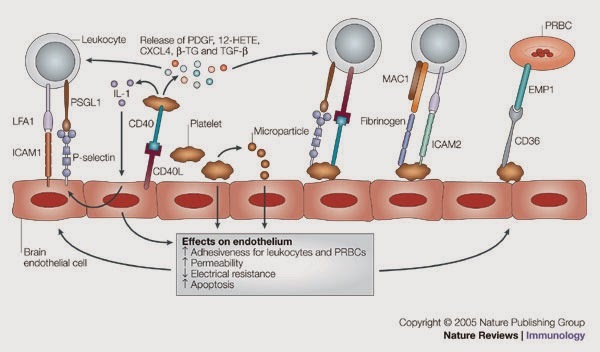 The second important step in the process is sequestration of parasitised RBC (PRBC). The PRBC accumulate in microvessels of various organs. In the brain, the most problematic is in brain especially cerebrum, cerebellum and medulla oblongata. The plugging of microvessels leads to hypoxia which stimulates further parasitic growth. Subsequently, this event leads to inflammation, with major role played by Pro-inflammatory cytokines and reactive oxygen species. The events lead to breakdown of BBB (Blood brain barrier), allowing uncontrolled movement of fluid. This leads to the hypertension and raised Intra cranial pressure. The increased pressure leads to neuronal compression and damage. In events of medulla oblongata being effected, vital functions may decline leading to death. As you see, the pathogenesis of CM is fairly understood. So the new study in NEJM doesn't surprise me at all. The only new thing is study they did an MRI. As Dr. Taylor comments. "I wanted to say to the parasite 'Ha! You never thought we'd get an MRI, did you?'"